“Health” is hot right now. Organic produce sales are growing at a faster rate than their conventionally grown counterparts. The growth in the gluten-free market has been insane. There’s a trend for big food manufacturers to buy smaller health focussed companies to make their product portfolio healthier: Campbell Soup Company bought out Blothouse Farms (smoothies and dressings), Coca Cola has recently purchased Fair Oaks Farms (for a high protein milk shake) and Kellogg’s aquired Gardenburger. Meanwhile health food companies (Annies and Hain Celestial, for example) are being tipped as hot stocks to buy. Whole Foods Market has successfully carved itself a niche in the upmarket health food grocery sector growing its customer base in spite of a recession. And most major supermarkets are trying to get at a little bit of the Whole Foods Market success by targeting the health food consumer with their health food offer going from being squeezed into a couple of bays to now spreading over several prime located aisles. The health message, is of course, not lost on the marketing department. It seems that a healthy solution is available for all tastes and meals. The problem is many of the products that are being sold as healthy, simple aren’t. Here are some things to watch out for. Myth: It’s natural and organic, therefore it’s healthy. A gift from the Gods? Or a sugar alternative? Example: Agave nectar is a natural sweetener that comes from a spiky aloe vera-like plant. The nectar (or syrup) is marketed as a “gift from the gods” and agave nectar manufacturers claim it’s “the preferred sweetener of health conscious consumers, doctors, and natural food cooks alike”. It might have been around for centuries and come from a plant (it also has a lower glycemic index than table sugar), but it’s still a processed sugar and doesn’t provide much nutritional value at all. Use agave nectar in the same manner as you’d use any other sugar. That is, use it rarely and in small amounts. I’m not saying that just because it is made with natural or organic ingredients it is unhealthy, it just doesn’t automatically make it a health food and there are two reasons why I highlight this on my faux health foods list. The first the fact that it is a natural or organic ingredient doesn’t change how our bodies metabolise it. Natural margarine is still margarine and organic sugar is still sugar. The second reason is both the terms “natural” and “organic” are poorly regulated. “Natural” particularly can be used freely by marketers (and there are some shocking examples of how it is used). “Organic” isn’t as clearly defined as it should be either. There’s no one method of organic farming and through the magic of USDA logic some “organic” ingredients on the USDA organic labeled foods list aren’t organically grown at all (perhaps another post). Myth: It’s Sugar free, therefore it’s healthy. Sugar free! But full of artificial sweeteners. If it’s sweet and it’s sugar free then it probably has artificial sweeteners in it (look for aspartame, neotame, saccharin, sucralose and acesulfame potassium in the ingredients) Sugar free options tend to be lower in calories than their full sugar versions (Diet Coke for example, has only 1 calorie) and because artificial sweeteners don’t raise blood sugar levels the same way as table sugar does diabetics may choose these products. The reason why sugar free products make my faux health food list maybe different than you’re expecting. 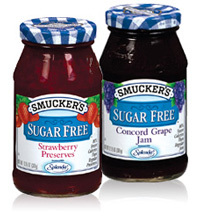 Popular wisdom tells us that sweeteners cause cancer (due to a lab rat study of saccharin and bladder cancer conducted in the early 1970s), but actually the science around this isn’t as clear cut as we’ve all been led to believe. Aspartame is one of the most heavily researched food ingredients ever and it’s been given the all clear by hundreds of health agencies world wide. However, there is more recent research that makes me weary of these products. There’s some evidence that artificially sweetened products may increase calorie consumption, weight gain and fat. The thinking is these substitute sugars are designed to mimic the taste of sweet foods which normally would come with a hit of energy. When we taste them we anticipate the calories to come and when they don’t we continue to eat until they do. Whilst the research on this isn’t conclusive, this stuff just doesn’t cut it as a health food in my mind. Myth: It’s Fat free, therefore it’s healthy! Lower fat but higher sugar. Using Stonyfield as an example here is probably a little harsh. Stonyfield go to a lot of effort to get all the ticks in the right boxes. In addition to their starter cultures they use additional probiotic cultures which creates a beneficial environment for digestion. They’re USDA organic certified, GMO free, hormone free and don’t use artificial colors, flavors, sweeteners or preservatives in their products. It doesn’t mean we shouldn’t look at the fine print though! Generally, to reduce the fat of a product manufacturers need to add something in its place. Usually sugar. At Stoneyfield it’s “naturally milled organic sugar” but that’s still sugar. 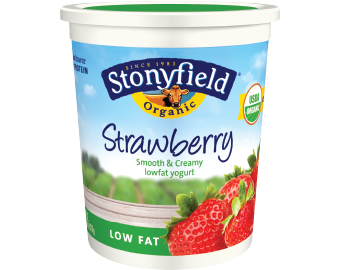 A cup of their strawberry yoghurt contains 35g of the stuff. Whilst their full fat version is lower sugar than the fat free (a common occurrence) at 30gm per cup it’s still a lot of sugar in a snack. Yoghurts are kind of an easy target for the sugar content because the lactose, of course, is sugar. However I find most yoghurts on our supermarket shelves have added a huge amount of sugar to suit an increasingly sweet consumer palate. Because of the probiotics this is a great treat but don’t fool yourself that it’s for unrestricted consumption. Myth: It’s full of nutrition, therefore it’s healthy. 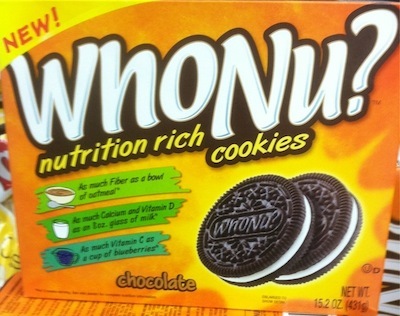 Oreo + multivitamin = WhoNu? Nutrition rich cookies. “Now delicious is nutritious too” claims the people at WhoNu? These “so nutritious” Oreo style cookies have “as much fibre as a bowl of oatmeal and as much calcium as a glass of milk”. It also has as much fat (7g), carbs (25g of which 14g is sugar) and as little protein (1g) as the same portion (3) of the original Oreo. The ingredients list begins with sugar (not a good start!) and includes canola oil, palm oil, kernel oil, soybean oil, partially hydrogenated cottonseed oil, salt and flavorings. The difference between this and an Oreo cookie is the WhoNu? manufacturers have added vitamins and minerals to make it “nutritious”. These cookies are as healthy as taking a multivitamin with your Oreos. Myth: It’s only 100 calories, therefore it’s healthy. 100 calories of junk food. I hadn’t heard of these 100 calorie packs until they were recently pointed out to me on the Leaping Zucchini Facebook page (please click ‘like’). 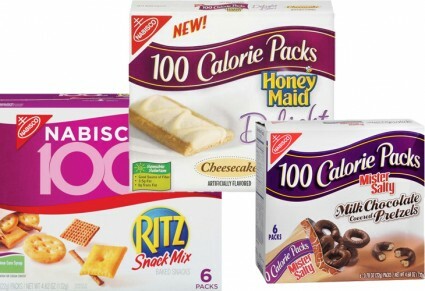 With a quick google search I was amazed at how many companies have packaged their junk food into these little 100 calorie portioned packages and marketed them as a good snacking option for those trying to lose weight. A 100 calories of junk food is still junk food. Most of the ones I looked at were full of sugar, cheap oils, sodium (some of the chips and crackers were 200mg per tiny pack), chemicals and virtually devoid of anything nutritious. These are an expensive, dieters gimmick. I can just see a box of these little packages being stashed in the office on a Monday morning and the entire box and 1,000 calories are done and dusted by 4pm. Who can stop at just one little pack of their favorite junk food after all? I’m all for portion control and understanding how many calories we’re really consuming in a snack, but eating real food and losing the taste for this rubbish is a much better way of approaching it. Myth: I found it in the health aisle, therefore it’s healthy. Surely it wouldn’t be merchandised in the health aisle if it wasn’t healthy? Within minutes of browsing the health aisle I had dozens of examples I could have put here. Smart Bacon (a vegan, junk filled bacon substitute), and PopChips (Never Fried. 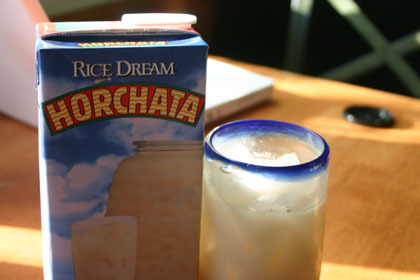 Never Baked) were close but I settled on this one: Horchata is a Hispanic drink that’s made from rice with “the perfect touch of cinnamon and vanilla”. It’s vegan and dairy free. It’s “traditional” and “exotic” and is found at my local supermarket with all those other “healthy milk alternatives”. It has 1g of protein per serve (standard milk is 8g), 4% of our daily calcium requirements (standard milk is 30%) and 18g of sugar per cup (standard milk is 11g and that’s all lactose not added cane juice which is used in this drink). I understand if you are vegan, gluten or lactose intolerant having these foods grouped together in these aisles is convenient. But when did vegan, gluten free and dairy free become synonymous with healthy? Many vegan substitute products are filled with all sorts of things that I can’t pronounce. Gluten free cookies are still cookies. Dairy free ice cream is still ice cream. The funniest (saddest?) additions to the health food aisles are fair trade products. Fair trade is a great initiative but even if the cocoa farmer in Bolivia gets paid fairly for his beans it doesn’t make your chocolate any healthier for you. How do I know what really is healthy then? Eating less out of packets and more from the fresh produce sections is a practical way of staying away from faux health foods. Although sometimes for convenience sake a packet makes it into the shopping trolley. So if buying food in a packet look at the back of the pack. Read the ingredients. What’s in it? I know some real food groups suggest only buying something in a packet if it has less than 5 ‘real’ ingredients. I’m not sure where the number five came from. Applying common sense I think is always a good rule of thumb! I try to stay away from added sugars, hydrogenated oils, artificial sweeteners and flavours, anything that’s a number and stuff that I’ve never heard of. I google ingredients I see on packets that I’m not sure about and find out what I’m eating. The more you look at labels the better you become and understanding them. This entry was posted in nutrition, tips for becoming healthier and tagged 100 calorie snacks aren't healthy, agave nectar, artificial sweeteners, dairy free, fair trade and health foods, fat free, faux health foods, gluten free, health foods that aren't healthy, Horchata, organic, sugar-free, vegan. Bookmark the permalink. Love this, great fact vs. fiction. I’d be curious to see your analysis of Weight Watchers items. Chocolate eclairs are “delicious and only 2 points each.” Two points will also give you a poached egg. I know which one I think is the better nutrition bang (and more filling) for the buck. Is it cynical of me to suggest Weight Watchers may be promoting its low point value products knowing that as soon as members resume a normal diet (“I’ve reached my goal weight so I’ll have a real chocolate eclair instead of a Weight Watchers one”) that they’ll bang all that weight straight back on again and whoopey-doo start paying their membership fees to start all over again? What on earth is nutritional yeast and what do I do with it? The Leaping Zucchini is a participant in the Amazon Services LLC Associates Program, an affiliate advertising program designed to provide a means for sites to earn advertising fees by advertising and linking to Amazon.com.